This site contains material relating to the book Darkwood Poems, by Brian Hawkins, published by Topknot Books. 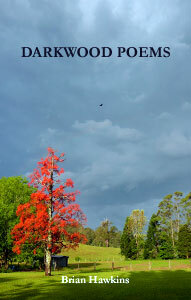 Darkwood Poems is about the Dorrigo/Bellinger area of New South Wales, specifically Thora and the Darkwood Road. The land is a treasure-trove, a biological jewel, an ancient refugium for thousands of amazing plants and animals that hark back to our ur-continent, Gondwana. When I arrived, I found it hard to believe that I could be lucky enough to live in such a place: all the riches of creation seemed to glitter before me. Many of these poems make up a sort of nature-diary, chronicling the events of a year (in truth, a couple of years, though the bulk of the book was written between January 2006 and February 2007) – though I hope they are more than that.